Custom promotional paper products are all around us, so much so that we sometimes don't even notice the impact they are having on us! You may be worried that the modern age's reliance on technology has put a damper on the promotional power of paper products, but that is far from the truth. We all scribble notes. 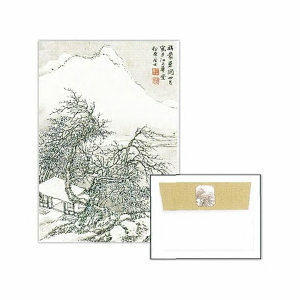 Nothing replaces the warm emotions associated with a personalized greeting card. The physicality of promotional paper products is where they get all their advertising power. As consumers, we're not even aware how many products are made of paper. Custom printing stickers, placemats, and signs, are a great way to increase your brand awareness and make your company more visible to your clients. Promo greeting cards, post cards, and invitations are a wonderful customized way to show how much your company cares about its clients, employees or students. After all, who doesn't love getting real mail in their real mailbox! These products are just dying to bear your logo and do some high value marketing in the name of your company. 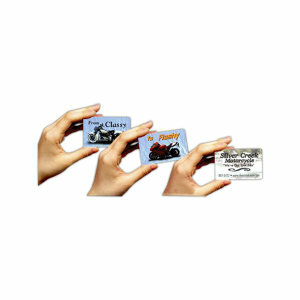 Start with custom printed business cards. Perhaps the most useful marketing tool business people have to work with. IASpromotes.com carries a range of sizes, shapes, and printing selections in order for you to advertise your corporation in exact accordance with your company's image. Every good business person carries a stack of personalized promotional business cards whenever he or she steps out the door. 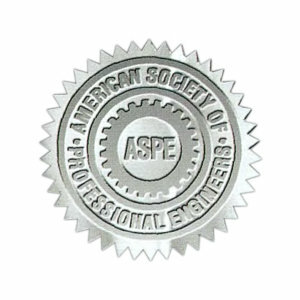 However, business cards aren't the only promotional paper product that you ought to have in your tool belt. 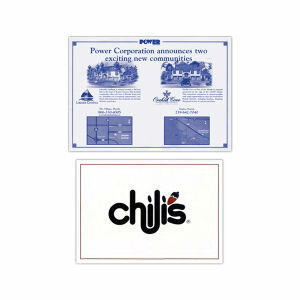 If you own a restaurant, or perhaps you're just hosting a large corporate dinner or company picnic, custom printed promotional placemats are a must have! With these promotional products, the entire time your clients are eating, they will be reminded who hosted the event or serves them dinner night after night. 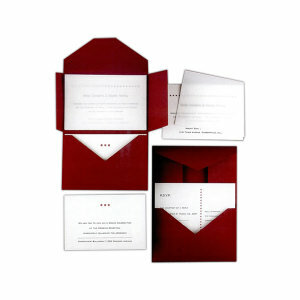 And don't forget to set out promotional printed napkins beside each and every plate! 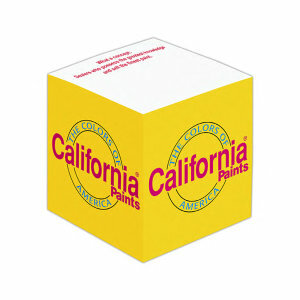 And all your clients should have a custom branded note cube sitting on their desks. We're a society of note takers. When the phone rings, the first thing we do is reach for our personalized note pad, because chances are high that we'll have to scribble down a bit of information. 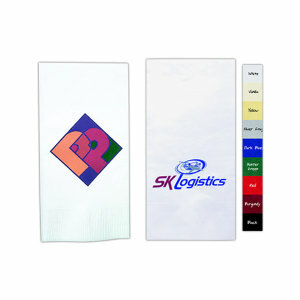 Be sure that your custom logoed note pad is the one that your clients are reaching for every time. 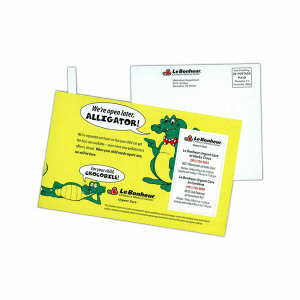 These note pads are a wonderful choice for trade shows or a corporate giveaway ad campaign. If you think technology has replaced promotional paper products, consider the last time you reached for your computer to jot down somebody's phone number. When we, as costumers or consumers, truly believe in a brand or image, what do we do? We hang up a custom printed sign or paste a logoed sticker in support of that brand! These promotional products are everywhere! Just take a look around. Promo signs hang in windows and sit in yards. Customized stickers are stuck on laptops, cars, windows, desks, and doors. 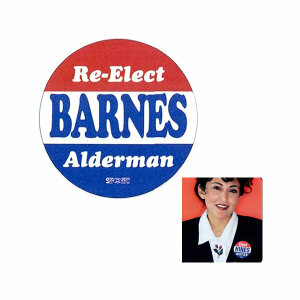 The promotional power of these two items is almost unmatched by any other promotional product. We're not joking. Just ask that guy over there with the water bottle covered in specialty stickers bearing the logos of the brands he loves. Pamphlets, pocket sliders, keypoints, and embossed seals work just as well. 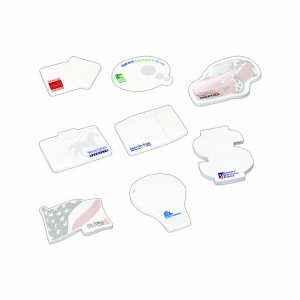 They are small, frequently use and highly noticed promotional products that increase brand awareness. They are not unwieldy but provide you with more space to build and explain your corporate message and initiatives to your clients or potential customers. Hand these promo paper products out at tradeshows or in mass mailings to quickly deliver your message and logo in a highly effective manner. We check the mailbox everyday even though most days it's empty. That's the modern plight, but it makes it all the more exciting and significant when we discover a beautifully printed letter, invitation, post card or greeting card waiting for us. Sometimes these small gestures can be the most important promotional move we make in any ad campaign. These promotional paper products have a high value at a low price point and keep your brand at the fore of your customers' minds. 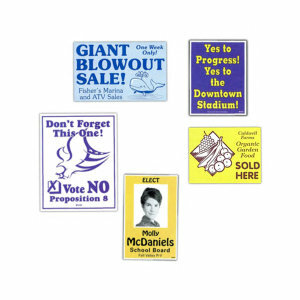 IASpromotes.com offers a variety of color schemes, shapes, and sizes, to fit any marketing campaign or corporate goal. IASpromotes.com has been working in the promotional product industry for over twenty years, and custom logoed paper products have composed a huge portion of our work the entire time. If you don't see the product you're looking for, email, call or live chat with us. We know where to find it! And if you're interested in a quote or placing an order, contact us for a super speedy response!